Since the Flyers have eliminated themselves in the playoffs a few nights ago, most of the team has tried to stay upbeat and think about next season. That is, of course, with the exception of our loud-mouth goalie, Ilya Bryzgalov. When Ilya, one of the highest payed goaltenders in the NHL, started rambling about tigers and the universe on HBO’s 24/7 I thought he was really hilarious. There’s obviously a screw loose somewhere in his head, but it was okay because it’s not like he was doing any harm in the process. Then he started to go downhill. Bryzgalov had a really bad streak for way too long in the middle of this season. He stunk. 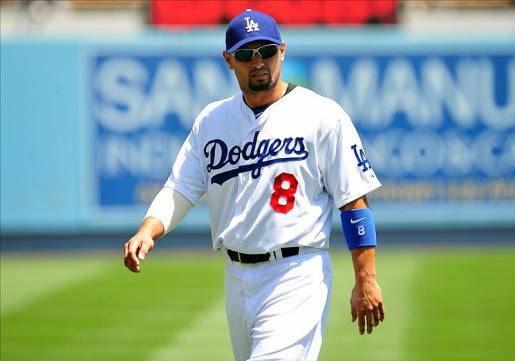 He was making more than most players on the team, and was sitting on the bench more than anyone too. So you can imagine how fans reacted. Not well. …Which brings me back to Ilya. Ohhhh, Ilya. He loves to complain about fans. During the hockey season he told one fan that he “cared too much” and then, when he was benched for the Winter Classic, turned weird with interviews and Twitter posts. Color me annoyed. Seriously Ilya? Seriously? Your life is so so hard. Oh, let’s all hold hands, light a few candles, and cry for Ilya Bryzgalov. He can’t seem to understand why fans might be annoyed about losses, so here, I’ll fill him in. We don’t get payed to love Philadelphia teams. This isn’t our career, but it is still our life. We devote our lives to one set of teams. We come home from our jobs and experience these teams as a solid and important part of our lives. When our team loses, we feel it. When we pay hundreds of dollars for tickets just so the Flyers can lose Ilya Bryzgalov sits on a bench counting his money and thinking about tigers, we get upset. And when the season ends, we don’t consult our agents to find what team is a better fit for us next season. We stay here. If Ilya Bryzgalov wants to go home and cry about it, that’s fine, but keep your mouth shut in the media. Because the people that he is insulting, the people that give him a hard time when he does poorly, are the people that care about him in his profession. And that’s why he’s a big ol’ jerk that needs to get over it. Call me old-fashioned, but there is nothing better than a man in a suit. I love suits, so much that I know the rules of the suit lifestyle. I know what’s appropriate, and how to wear a suit if you want to look like a real pro. If I see a guy not wearing a suit correctly, ohhh I judge. I judge hard. I just love suits. One of my favorite things to do while watching a sports game is to check out the suits of commentators, coaches and injured players. Malik Rose’s fabulous tie collection (if you have two hours I can tell you all about it…AMAZING!) and it makes my day when Magic Johnson decides to go with the full three-piece suit. I can even respect Charles Barkley’s humongous neck and lack of tie because he pulls off the look anyway. I’m not crazy about it, but I deal. Why? Because I love and respect a sharp-dressed man in the media. It’s just the way it should be. So what don’t I love? When a rich and famous athlete is too busy being rich and famous to throw on a suit and look like a professional. Case in point: last night’s 76ers-Bulls game. Now I was already bummed out after the Phillies’ loss and the Flyers’ loss to take them out of the playoffs (seriously…ughhhhhh) in the same night so I was going into that last game of the night feeling pretty grumpy and that’s when I saw Joakim Noah. On the bench for a sprained ankle, Joakim decided he was a little too busy not doing his job (yeah, yeah, yeah sports fanatics I know that’s not exactly the case, just let me rant) to actually put himself together and dress like an adult. So he parks himself down in nasty, old-looking brown khakis, an over-sized and untucked v-neck, a blazer that looks like it needs a trip to the cleaners, and a gigantic bauble necklace that looks like something my grandmother owns. My jaw dropped for about a second, which was followed by a nice, long rant to my boyfriend (he deals with a lot of my anger-rants about celebrity clothing, I’m pretty sure I might give him a complex about his own style soon) about what a disgrace this “dude” is. 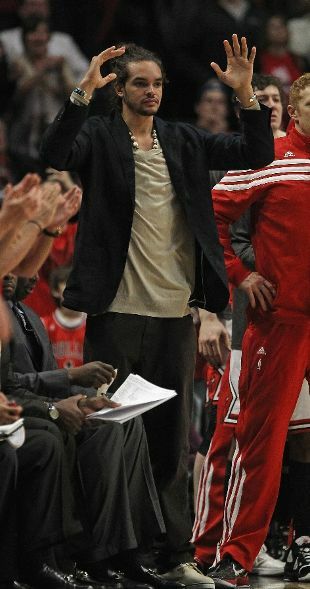 First of all Joakim, cut your hair. A messy bun isn’t a good look on girls, and you can’t pull it off either. Second of all, ditch the bracelets, you’re not Enrique Iglesias in 2001, wear a shirt with buttons, and put on a damn belt! What is this outfit? You think you look cool? Do you think any woman finds you more attractive because you forgot to do your laundry yesterday? Do you think the “just rolled out of bed and into my professional career where I make a ton of money but don’t care because I have no respect for anyone or anything” look will land you a smart and sensible lady? It won’t! Listen guys, wearing a suit isn’t that hard to do. Ohhh it hurts my neck ohhh there isn’t a stretchy waist band… enough. Women wear heels every damn day. They stab their heads with a million pins and cover their faces in makeup. They dangle big giant earring from their ears and resist the urge to pull at stockings and strapless dresses and itchy fabrics all in the name of looking good. All you have to do is remember to unbutton your jacket when you sit down and wear a tie. That’s it! Athletes of the world, it’s time to man up. You’re representing a team that pays you a lot of money with fans that put a lot of energy and pride into caring about you and your outcome. The least you can do is show a little respect and dress like you care about your job and your fans. Enjoying a teeny, tiny beer and the Flyers on this fabulous Sunday. Happy weekend everyone! And happy birthday to the Phillie Phanatic!! 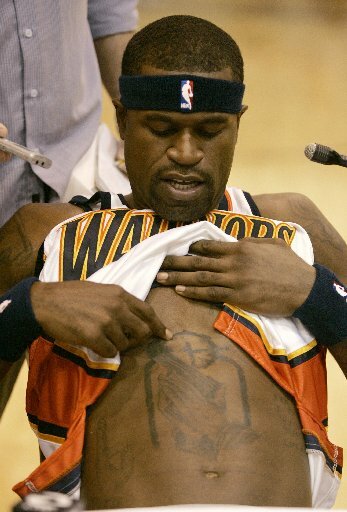 I am amazed by how many stupid tattoos there are in the NBA. Seriously it’s like they just develop a big stupid idiot gene and just went crazy with the tattoo gun. Don’t believe me? Check out this ridiculousness. Christopher… Don’t you have a mother!? Seriously, what do you think she is thinking every time she goes to hug her little boy and all she sees is a neck full of badly drawn letters and flames. Oh and of course there has to be a picture of a basketball player. Because god forbid someone forgets for five seconds that you play basketball. How could you!? You know those are forever, right!? And your neck says “Free Bird” across it. Free bird? Seriously? Free bird? That’s not even cool! That’s a song that’s overplayed by high school freshman boys with gross half-mustaches and body odor! 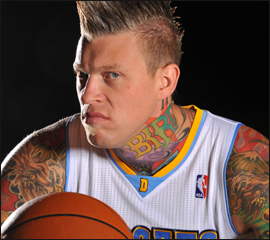 Ohhh look at me, I play basketball so I have to have a mohawk and stupid obnoxious neck tattoos. Because I’ll be in the public eye forever and these won’t look stupid when I’m old. I want all my readers to look at this photo, then click this link. It only took nine years for ol’ Chris to go full douchebag, so sad. Please, Mr. Andersen, you’re a disgrace. You better invest in some turtle necks and hope they make a comeback STAT. I love my team, but Lou Williams is covered in bad decisions. The checkers covering his right armpit especially drives me insane. Is it that necessary to cover your entire body with tattoos? And he’s one of those guys- and unfortunately there’s so, so many of them- with a basketball tattoo. A tattoo of a basketball. Because the rest of the world doesn’t know you’re a professional basketball player and because of that you play with basketballs. Really, seriously guys, get a more obvious image inked across your skin. I guess in Lou Williams case it’s not too bad because he’s so covered tattoos that the dumb ones get lost in translation… or do they? 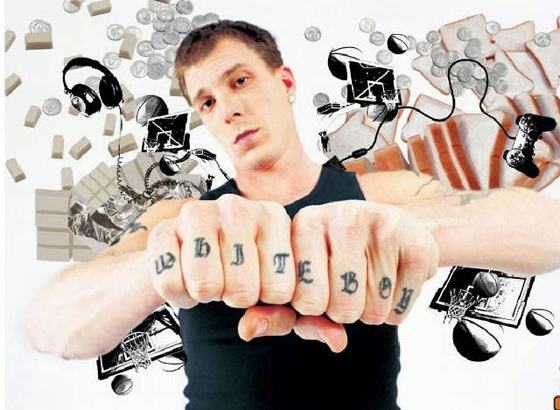 It’s a good thing Jason Williams got “White Boy” tattooed across his nuckles or we all wouldn’t know that he was a white boy. If we’re really looking at it the tattoo doesn’t even say “White Boy,” it says Whit Eboy. And that’s not a thing, so that makes Jason Williams stupider than his tattoo. In my opinion one of the manliest things a man can do is present a nice, solid, firm handshake in a sharp suit. 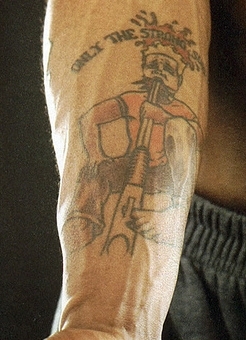 And Jason Williams has tainted his manliness with an ugly tattoo. When you get married do you think your wife is going to want to slip a ring over the “O” in your finger tats? Come on, white boy. Jackson has, smack dab in the middle of his abs, two hands together in what looks like a symbol of prayer. The whole idea of prayer and peace and all that gets completely smashed, however, when you take a look at the gun that is being sandwiched between the hands. 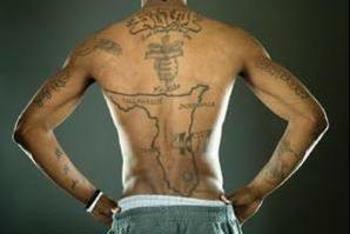 According to Jackson, the tattoo is a message to himself, saying that he prays that he never has to use a gun again. First of all, don’t go advertising that you had to use a gun in the first place. 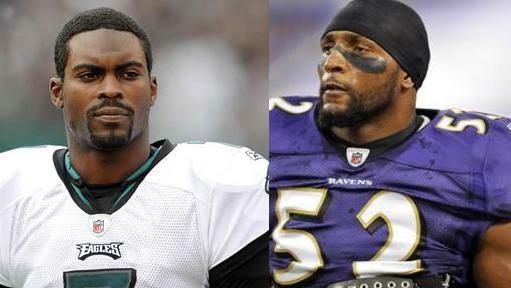 I’m tired of athletes walking around with guns trying to look tough. It’s more stupid than anything. Second of all, you know what’s another good way to pray that you never have to use a gun again? By actually praying! If that’s what you’re trying to do, then actually do it! Don’t just slap it across your belly! Thank you for that stunningly brilliant sentimentality, Marquis. That painfully unoriginal and ridiculously bland description completely validates such a graphic and insensitive piece of crap on your arm.